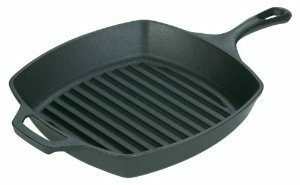 Lodge Cast Iron Square Grill Pan Only $14.22! You are here: Home / Great Deals / Amazon Deals / Lodge Cast Iron Square Grill Pan Only $14.22! We don’t do a lot of grilling this time of year, but sometimes I (Amber) want a burger! This Lodge Cast Iron Square Grill Pan would be perfect! And, right now, you can get it on Amazon for only $14.22. Super Saver Shipping will be FREE with an order of $35 or more or get FREE 2-day shipping with Amazon Prime.